Bake pizza and cook pasta, spaghetti and other Italian dishes. You can learn how to make pizza, how to cook Italian spaghetti and other pasta dishes in the best way: with an Italian chef in an Italian restaurant but here in Thailand! From recipes to tips. Also how to make tomato sauce and how to serve the customers. 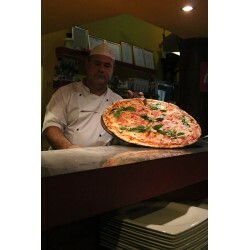 Not only learning Pizza & Pasta: learn how to run a pizza shop, how to cook original Italian dishes. The course will be live in an authentic Italian restaurant. Don't waste your time learning how to make a non-pizza. Here with an Italian chef you can really learn how to make pizza and even important suggestions in how to run a pizza restaurant or pizza place and more about Italian cuisine. Italian chef will teach you straight in an Italian restaurant. learn to cook live and you will never forget. LEARNING There are 2 products. ฿ 30,000.00 You can book now! Learn how to make pizza with an Italian chef in Phuket. if you book for 2 people you have a discount of 5,000 baht.